After revealing our June Qualification Grant Finalists last week, we’re excited to announce our qualification grant winner. Congrats Marcie Colledge, co-founder of Yellow Scope. Read on to learn all about Marcie and her business. WN: For those who don’t know what Yellow Scope is, could you tell us a little bit about your business and how you and your co-founder met? SM: Yellow Scope is a Portland-based company, founded by scientists and moms, Kelly McCollum and Marcie Colledge. 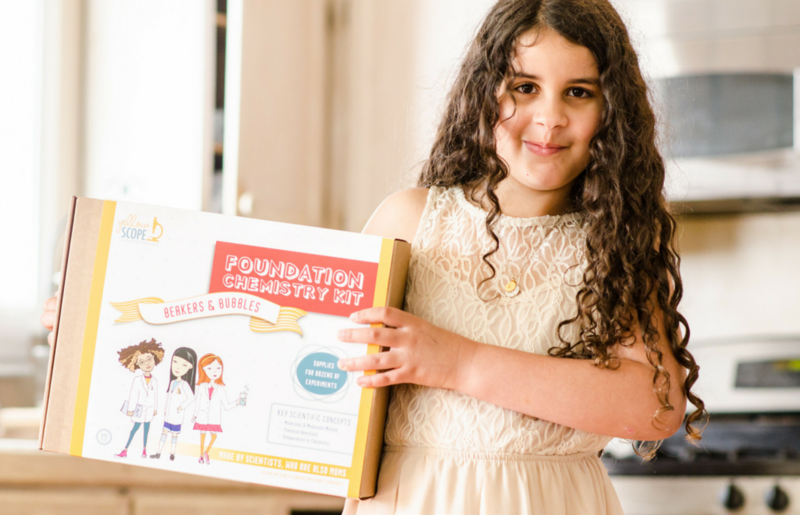 We started Yellow Scope because we think girls deserve better in the toy aisle – where rigorous chemistry and physics kits are marketed to boys, and pseudoscience spa and beauty kits are marketed to girls. Girls internalize messages that science is for boys and over time they lose confidence in their scientific abilities. In 4th grade most girls say they like science, but by 8th grade, the numbers drop dramatically. This trend continues beyond school – while women make up half of the total work force, they make up only a quarter of the jobs in science, technology, engineering and math (STEM) fields. STEM jobs are solving the world’s most pressing problems. In the US, STEM jobs are growing at a three times the rate of non-STEM jobs. On average, careers in STEM fields pay 33% more than other fields. The wage gap between men and women is less in STEM jobs. We started Yellow Scope with the goal of closing the gender gap in science. Our mission is to keep girls excited about science, build their confidence, and help them to see themselves as scientists. At Yellow Scope, we make a different kind of science kit – one that takes girls seriously. We are the perfect team to start this company! We’re both trained scientists. Marcie has a PhD in neuroscience and over 20 years of experience designing and running experiments at the lab bench. She ran her own research lab as tenure track professor. Kelly has a Master’s degree in epidemiology and biostatistics and ran large biomedical research studies for over a decade. She also taught middle school science. We first met in 2009 at our daughters’ elementary school, where we volunteered together for six years running the Family Science program. In these sessions, we designed exciting and engaging hands-on science experiments for kids and their families around different science topics – microscopy, genetics, computer programming, electricity and magnetism, forensic science and more. While volunteering together, we realized our shared passion for science and education. And, as moms of girls, we also were determined to do something to encourage more girls to be excited about science. Thus, Yellow Scope was born! WN:Do you test each experiment with your daughters first? SM: Yes, we test everything with our daughters early on. Kelly also has a son who loves testing experiments. Luckily our children enjoy science! We also run focus group sessions with our kids’ friends, at local toy stores, and with local Girl Scout troops. WN:Have you thought about selling your products to other teachers to use in class? SM:We have thought about selling our products to teachers and would be delighted to have them in classrooms. Our “magic sauce” is our ability to take complex science concepts and distill out the most important components. We then design numerous experiments around these essential concepts. This approach builds mastery by helping kids develop a deeper understanding of fundamental science principles. We also teach kids how to apply the scientific method and how to design their own experiments. The content in our kits aligns with Next Generation Science Standards and would be a great resource to teachers wanting to add more experimental science into their classrooms – particularly before middle school when the rigor of science tends to pick up and many kids start to fall behind and/or lose interest in the “hard” sciences. One idea we’ve discussed is developing a special package just for groups. Each package would include ten lab notebooks and five sets of lab equipment. If kids work in pairs, each box would work for ten students. WN:What are your long-term goals in terms of expanding your business? SM:Our plan is to develop a whole line of science kits across different subjects – chemistry, physics, biology, environmental science, food science, neuroscience, and more. We plan to expand geographically throughout the United States and Canada. We’re currently in about 70 stores in the U.S. and will soon be in a chain of bookstores in Canada called Indigo. WN:What’s your advice for other women entrepreneurs out there? SM:Find a good co-founder! Starting a business is exciting, but it’s also a lot of work. There are lots of up days and also some down days – sort of like riding a roller coaster. We have different areas of expertise, we support each other, and we laugh (a lot!). The whole start-up process would be more stressful and a lot less enjoyable if we were doing it on our own. And if you’d like to vote for Marcie and Kelly to win the $1,000 Amber Grant, you can vote for them here. Thanks for reading! Remember that we award a grant every month – if interested, please apply today.